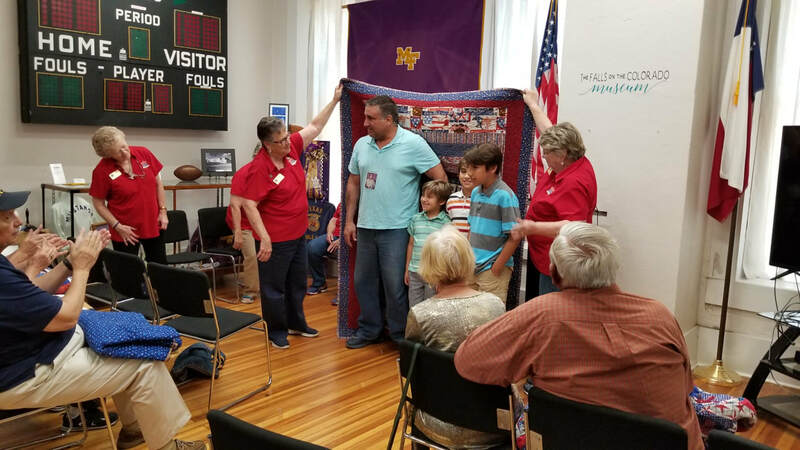 The Falls on the Colorado Museum (FOCM) is joining with the Noon Rotary Club, Bluebonnet Chorale, Quilts of Valor, and VFW Post 10376 of Marble Falls to honor our area Veterans on Saturday, November 10, at 2:00 at The Falls on the Colorado Museum in Marble Falls. It has been 100 years since the United States entered World War I to support our allies. FOCM’s program this year will feature the amazing story of Sgt. Stubby, the first “service dog.” During WWI, Sgt. Stubby helped thousands of young soldiers endure the stress of going to war. He ate with the soldiers, slept with them, protected them and comforted them when they had nightmares. 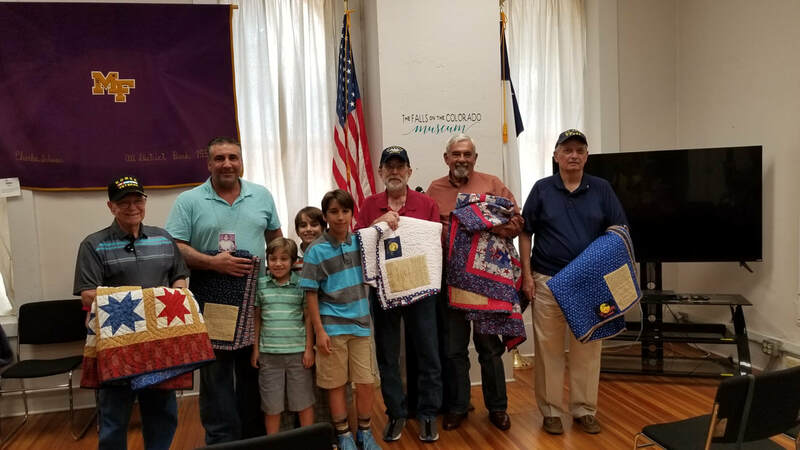 Also this year, Quilts of Valor will be awarded to 6 veterans: Robert Alexander, Arthur Treadway, William Kuschke, Sheila Kuschke, Leslie Wood, and Larry Zachary. 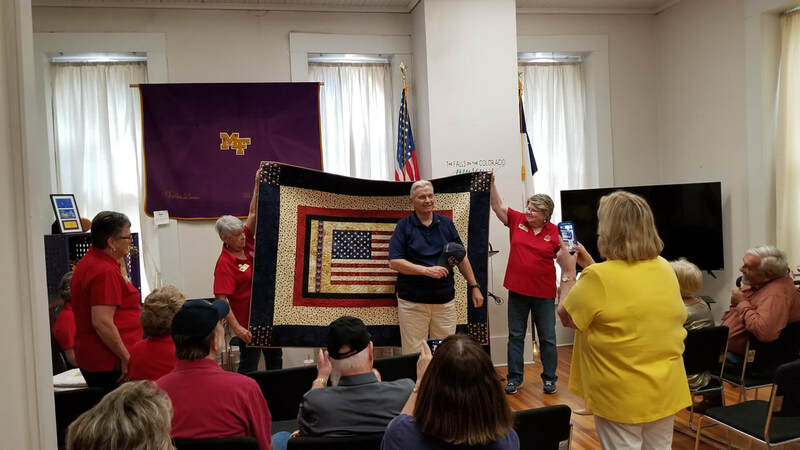 The Bluebonnet Chorale will again provide patriotic music and Iain Corley from Marble Falls High School Band, will bugle at the raising of the flag and TAPS at the closing of the program. The VFW Post 10376 Honor Guard will be participating in the program also. FOCM continues to display the WWI uniform of William Leon Whitman who lived in Pleasant Valley, a community east of Marble Falls. The World War II uniform of J. H. Frasier, from Double Horn, remains on display. Frasier was held in two Japanese prisoner of war camps from 1942 until he was rescued in August 1945. 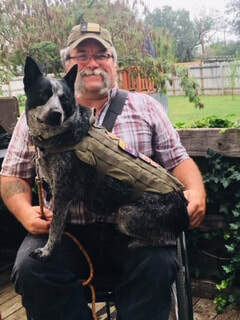 This year, FOCM will welcome two area veterans and their support dogs: Rodger Woods and Pepper and Bobby Galyon and Rock. FOCM welcomes all veterans and if you have a support dog, that special buddy is welcome too. As always, there is no admission fee to the museum, but donations are greatly appreciated. Regular museum hours are Thursday through Saturday, from 10:00-4:00. The museum is located at 2001 West Broadway, Marble Falls. Phone 830.798.2571. Visit our newly remodeled website: www.fallsmuseum.org. On October 13, 2018 at 10 am, our beloved 1,100 pound Miss Rockie will make her long a"weight"ed debut. The museum will be hosting an unveiling ceremony and an associated program to accompany this momentous event. Manager of the the University of Texas' Osteological Prep Lab, Kenneth Bader graciously worked with the museum to fully stabilize and restore the 700 year old specimen to her glory. We look forward to welcoming Miss Rockie back to the museum. 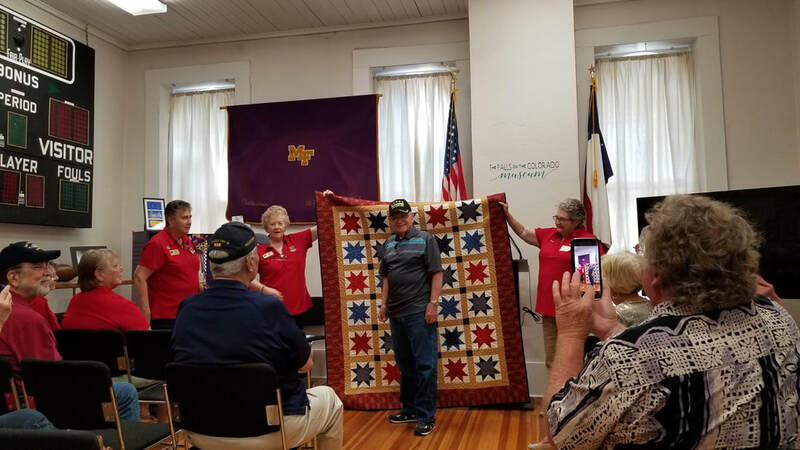 The Falls on the Colorado Museum (FOCM) proudly partnered with the Highland Lakes Area Quilt of Valor program for a presentation of five (5) Quilts of Valor to area veterans at a ceremony held on Saturday, May 19, at the Museum. ​What better way for two organizations to blend their efforts than to honor men and women who have so selflessly given so much for our country and our citizens. These veterans cannot, and should not, be forgotten. 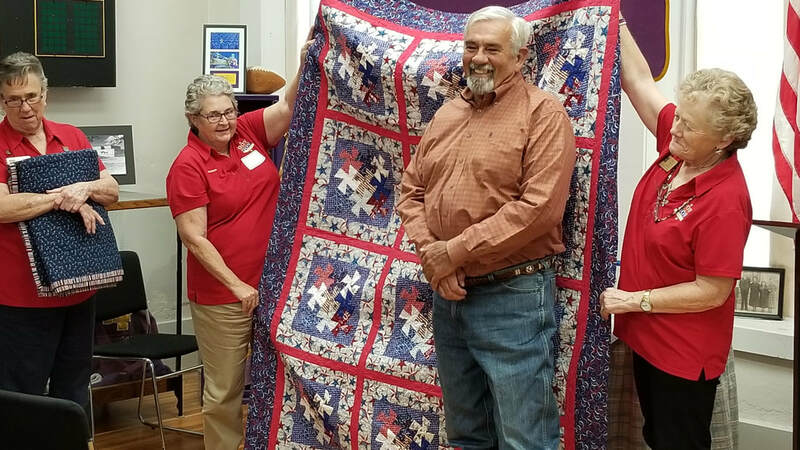 Chaplain John Kallerson opened the door for us at Walter Reed primarily because his wife Connie Kallerson happened to be a quilter. She impressed upon him how comforting quilts can be. 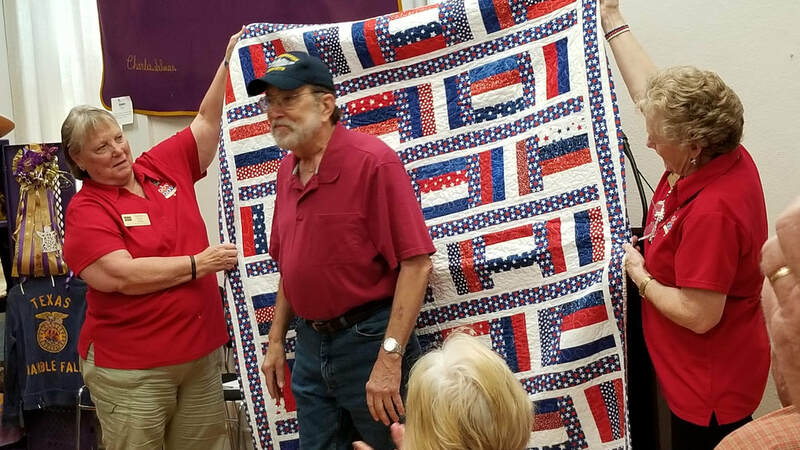 John also saw the value of awarding quilts to his wounded because of the message they carried that someone cares.